Knitscene has always been high on my list of favorite magazines. The aesthetic is fresh, the styling is beautiful, and I can count on seeing some of my favorite independent designers represented. Their first Summer issue is no exception, and with four designs in Classic Elite yarns, I couldn't be happier. All photos are by Joe Coca. The French Creek Skirt in Katydid was designed by Laura Birek who you may know if you've ever seen the pullover she designed back in 2008, an intarsia version of Shepard Fairey's Obama poster with the work "Hope" written across it. I'm not a knitted skirt person generally, but the openness of this one appeals to me. It's not as much a garment as it is an accessory, and I love the look of it over wide leg pants or a long skirt. The Mountour Falls cardigan from Melissa Goodale is an open cardigan with beautiful, delicate, twisted cabling around the hem, cuffs, and band. Cotton Bam Boo is the perfect choice, with its combination of drape and weight. The Lodi Cardigan by Tanis Gray is a fitted cardigan with eyelet raglan shaping knit in Solstice. I love the slim fit of this cardigan, and the the embellishments at the waist and elbow add visual interest and flatter the figure. Pick this up at your LYS or online on April 19th! A provisional cast on is a method of casting on that keeps the cast on stitches live, meaning that you can put them back on the needle and knit in the other direction. You'll see it used in our Web Letter pattern of the week, the Posh Neck Scarf. You can also see it used in a few pieces in our Spring 2011 collection: Verona, Nigh Duck, Chicory and Clover. Scroll to the end for a video showing the provisional cast on in action. 1. First you need a length of waste yarn, preferable contrasting. Nothing too wooly or sticky (so don't follow my lead and use Ariosa.) You also need a crochet hook in a comparable size to your needle. Don't overthink the size of the crochet hook, I'm sure you have one that will work somewhere in your notions bag. 2. Make a slipknot and place it on your crochet hook. Hold the hook in front of the knitting needle and the working waste yarn behind the needle. 3. Use your crochet hook to hook the yarn and pull it through the loop on the crochet hook. 4. Move the yarn (which is now in front of the knitting needle) back to the original position behind the needle. 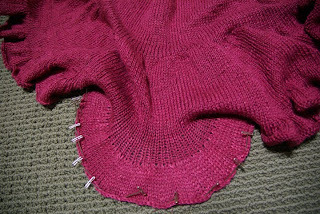 Repeat steps 3 and 4 until you have the desired number of stitches on the knitting needle. When you have one less than you need on the needle, remove the crochet hook and put that last remaining loop on your needle. Tie a knot in the end so you know where to start picking out the waste yarn. Then, using your project yarn, start working in your pattern. To see it in action, watch our video below! I know Spring is upon us, but I simply cannot resist talking about Kumara. I knit the Canape hat (Rav link), designed by Jared Flood for our Bistro booklet from Fall 2010, and have been wearing it every day since I finished it. Its slouchy shape is so flattering, and its the perfect topper in this winter/spring limbo we're experiencing in the Northeast. Kumara is a yarn of 85% extrafine merino and 15% camel hair. The merino is dyed before it is plied with the undyed camel hair; the blend makes all the colors look soft and muted with a beautiful halo. If you look really closely at the strands, you'll see that the camel hair stands out as microscopic fuzzy little hairs. It's unbelievably soft and has six plies, making the stitches really pop. Clara Parkes reviewed it in depth in the indispensable Knitter's Review. So far this year, I've used it twice--once for Idlewood and again for Canape. 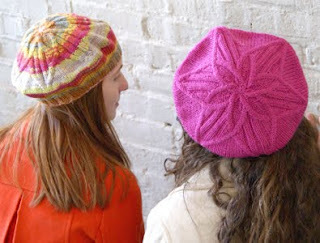 Here are some patterns from our Web Letter knit in Kumara. Cast one on now, before its too late! From left to right, Daniel's Scarf, Kumara Diamond Cap, Cowl Hood, and Arm Warmers. Click the picture for the pattern. Blocking is an integral part of the knitting process. It evens out your stitches, manipulates the size of your finished piece, and produces a smooth, polished looking garment. My third knitting project ever, as an obviously uneducated knitter, was a cabled baby blanket knit on US3 needles. Sigh. That thing was my albatross. 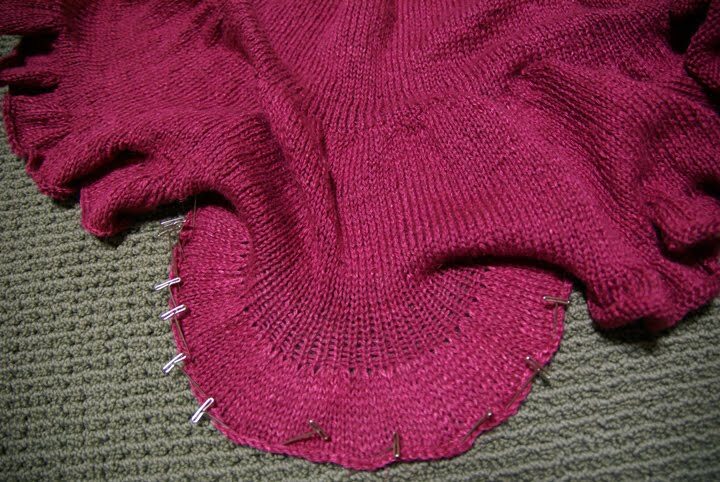 When I was finished, I was dismayed to see that my reverse stockinette was lumpy and uneven, that my cables were bunchy and drew the fabric in too tightly in columns down the length of the blanket. My friend and teacher, Amy, shrugged and said, "Just block it!". I was mystified and had her send me step by step instructions. There's something really scary and seemingly counter-intuitive about plunging your FO into a sudsy bath. What if it's ruined?! When I pulled it out, it was so fine and even that it felt like a bed sheet (but not so fine that the cables disappeared). It was perfect, and I was hooked. I block every single thing I make. 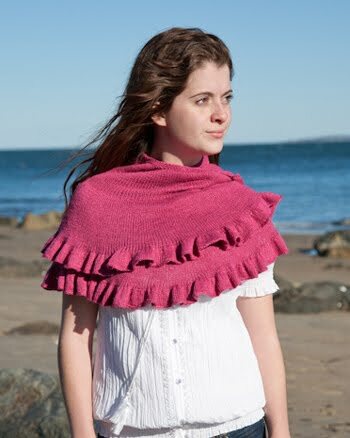 At the top of this post is Appledore, a shawl from our Spring 2011 booklet of accessories and small garments, High Seas, knit in Firefly. Below are some pictures of it on the blocking board. Do not be deceived, fellow crafters, not all blocking methods are created equal. They range from a subtle spritzing to aggressive plunging. For wool and wool-like fibers like alpaca and camel or llama, wet blocking or steaming is recommended. I often wet-block, and find it suits me quite well. The supplies I make sure I have at the ready are a tape measure, my pattern's schematic, tons of pins, a flat slightly puffy surface to pin to, and either a cup of coffee or a beer depending on the time of day. No, seriously. This might take a while, so I make sure I have provisions, coffee and/or beer being staple liquids in my household. 1. Soak your piece in tepid water for 15 minutes. You can use a no-rinse gentle wool cleanser if you wish. I use Eucalan or Soak, and the delicate smells make me feel oh-so-professional. 2. Your piece will be fragile! Carefully squeeze, do not wring, the water out of it. 3. Roll it in a towel to remove most of the water. For large pieces, I forgo the towel and put it in a pillowcase in the washer on spin cycle only. The centrifugal force will squeeze the water out for you. 4. Lay it out flat on a surface you can pin. I use my bed--I have a great quilt with lots of linear blocks that help me keep it straight. Some people use foam core that you can get from Staples, or even a blocking board made specifically for this very purpose. 5. Pin to your desired size using T pins or straight pins with colored heads, which I find are easier to track down. 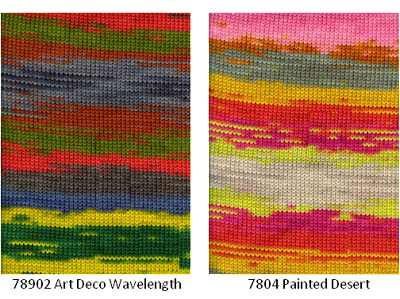 I take these steps after weaving in ends, but before snipping them too close, and before I seam my pieces. I make sure to measure each piece carefully according to my schematic, every last measurement including shoulder slope. 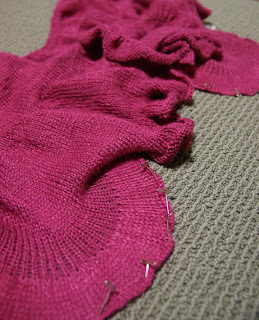 Do not block your ribbing! That is designed to stretch, right? So don't stretch it out before it's on your body! Mohair/Angora/Wool Blends: wet block by spritzing with water and pinning out. Synthetics: just a note, these often don't possess the elasticity of a natural fiber and blocking doesn't have the same magical effect. This is why I avoid using synthetics for lace or even some cabling, I know I can't have the luxury of stretching and evening out my finished object. Ask me how I know. Cotton/Linen/Hemp: Wet block or steam with a warm/hot steam press. You can also dampen a cloth and place it on top of your pieces. Then hold your hot steamy iron right over, not on top of, the cloth. March Liberty Print colors and patterns! We gave you a little teaser on Monday, but here's the real deal--March Liberty Wool colors are here, along with two new patterns, free for our subscribers. 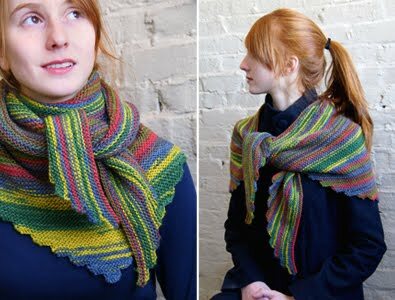 An easy-to-knit wrap worked entirely in garter stitch from the bottom point up with a scalloped bottom edge. A beret-style hat worked from the bottom up with a ribbed based and a cabled top. The crown decreases are incorporated into the cable pattern, which uses a variety of cable stitches to create a flower with six petals. Is your LYS a subscriber? Liberty Print was a runaway hit in 2010, and we wanted to make sure we get our gorgeous new colors on your needles and hooks in 2011. Thus, our Liberty Print Subscription service was born. 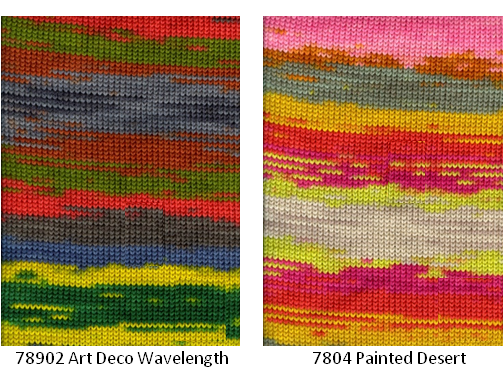 Two colors will be released each month until June, and any LYS that subscribes will receive one (or more) bag of each. All our subscriptions get first priority, and will ship before any other orders! That means if your shop is a subscriber, they are guaranteed to be the first to have these colors in stock, and you'll be the first to have them in hand.